David Cameron says vote "settles will of the Scottish people"
Voters answered: "Should Scotland be an independent country?" That's all from the live page updates for today. We will be back at 08:00 to cover the latest developments in this story. The Daily Record went with "the dream shall never die", but The Times wrap instead declares it's the "end of a dream". Labour's shadow attorney general, Emily Thornberry, tells the BBC's Scotland 2014 that David Cameron is "trying to hitch a whole lot of other stuff" to plans for more Scottish devolution, including English votes for English laws in the Commons. "It is simply not possible to stitch these two things together," she argues, and accuses the prime minister of a "pretty glib, pretty party-political and pretty facile analysis of what needs to happen next". Here is tomorrow's Scotsman front page. Former chancellor and Conservative politician Kenneth Clarke told BBC News the prime minister and the parties at Westminster would want to stick to the timetable given to Scotland for more powers. He said: "Once everyone has calmed down we will get back to delivering to the Scottish people the promises made in this referendum." Scotland's Daily Telegraph: Alex Salmond "throws in the towel". Former SNP MSP Andrew Wilson said Alex Salmond had chosen his time to leave with his usual impeccable timing. "I think his second retirement should be more rewarding than his first," he said. A Police Scotland spokesperson confirms three arrests have been made so far following trouble across Glasgow this evening. Investigations are under way and officers will be conducting enquiries retrospectively which could lead to further arrests. Following rumours on Twitter of a stabbing on Buchanan Street, Police Scotland say no-one has given them any information on such an incident. Former special adviser to Alex Salmond, Stephen Gethins, told Scotland 2014 that his ex-boss had a massive impact of politics. He said: "He is still the most popular politician in Scotland after seven years in government. I am really personally sad to see him go." Professor of public policy at Edinburgh University James Mitchell told BBC News that Alex Salmond had taken the SNP from a "fringe party to a party of government". Fiona Watson: As a yes voter I accept the result and will play my part in taking the decision forward. However let's not forget the amount of yes voters and the promises that have been given to Scotland and the timescales. If for any reason Westminster fall short on the vows they made then all bets are off. The possibility of a future referendum cannot be dismissed. Geoff Tompson: I confess to being pro-UK sticking together but, had Scotland chosen to split, that would have been the population's democratic right. Though I didn't accept Alec Salmond's views, he did create an environment within the UK that I hope will genuinely benefit us all by creating a fairer society for all our citizens. I'm therefore saddened that he has chosen to resign with his job unfinished. At the very least he should stay until the next General Election to ensure Westminster is held to account and to make sure it follows through on the promises it has made to the Scottish people. As an Englishman I want to be part of an inclusive UK that is fair for all. Alec Salmond has not yet failed, he has merely started a long overdue process to ensure that all UK citizens are fairly represented, I therefore hope he will reconsider his decision and that the SNP has the sense to back him for the benefit of all UK citizens, be they Scottish, Welsh, Northern Irish or English. Neil MacDonald: This has been a nasty campaign from start to finish, but what has been missed in all the rhetoric is this was a fight for the soul of our country. The quiet, dignified majority do not believe in separation. We demonstrate our national identity by our consideration and care for others, in particular our brothers and sisters in the rest of this island. The sickening scenes we are witnessing in George Square are not about a disenfranchised electorate, but are a result of the Pandora's's box which this campaign has opened. Tonight's comments, tweets and texts have been produced by the BBC's Bernadette McCague, Amber Dawson, Andree Messiah and Kerry Alexander. I don't think I have ever experienced a day quite like this. A vote to reject major constitutional change in one country has actually triggered a debate about major constitutional change in all the countries of the UK. And the man without whom all this might not have happened, Alex Salmond, has quit. When we analysis this vote, it wasn't about purely independence, about self-government, about national identity. In many ways it was treated by the electorate here as a referendum on the Westminster establishment, on the way power works in the United Kingdom today. And many people, No as well as Yes voters, were deeply unhappy. The Independent goes for "the disunited kingdom", looking at David Cameron, Ed Miliband and Alex Salmond. Andy from Wales: My family and I live in Wales and I in particular have been watching this campaign with huge interest. I have lots of friends and work colleagues who live in Scotland and voted yes for independence. I am glad Scotland decided to stay but am also proud of the 1.6 million Scottish people who voiced their opinion. As a country we now have to listen to the strong voice of those people despite it being a minority result for the yes campaign. I am very patriotic and proud to be Welsh but do not support any kind of independence for Wales I just don't think the country can stand on it's own two feet. We are a unique United Kingdom. The Daily Telegraph focuses on The Queen's "pledge to help reunite" the UK. Alan in Glasgow: Disgraceful scenes at George Square. Sums up our "Union" as we know it in Scotland. Wait for the hand wringing of Unionist politicians about the loyalist behaviour, but they haven't a problem accepting their votes!! Scotland's shame laid bare in front of a watching world. Deputy First Minister Nicola Sturgeon is tipped to replace First Minister Alex Salmond as SNP leader, by the Daily Star of Scotland. There's a special edition of The Independent's i on Saturday newspaper - "What now for the UK?". Comedian Limmy tweets: I feel a lot more in common with No voters now, not less. Because that stuff in George Square, I know neither of us are that. Channel 4 correspondent Alex Thomson tweets: "There is no question that there was a minority out to cause trouble and the sectarian tinge to some chants and flags was clear to all." The Daily Mail looks at what it all means for England. The Scottish Daily Express go with the headline "Salmond falls on his sword". Tomorrow's Daily Record leads with First Minister Alex Salmond's "dignified promise" that the Scottish independence dream shall never die. Tonight's episode of BBC soap Eastenders included a scene in which two characters discussed the No vote in the Scottish independence referendum. In a scene in the cafe, Tamwar Masood (Himesh Patel) says to Jay Brown (Jamie Borthwick): "It's nice the Scots did not forsake us. Although it got a bit desperate towards the end there, all that needy 'don't leave us' stuff from our side." Tamwar then tells Jay off for not having more to say on "Scotland deciding against independence". He says: "What could have been the biggest story in UK history in hundreds of years and you have nothing to say about it." Jay replies: "They voted No didn't they. So everything stays the same"
The cast had filmed two scenes in advance to reflect both possible outcomes of the referendum. A post on the show's official Facebook page explained: "As EastEnders viewers are aware, the residents of Walford will often reference topical issues to reflect big moments that our audience are talking about. "As we knew the referendum was approaching, we filmed two different scenes to ensure that either outcome of the vote was covered." tweets: #GeorgeSquare At this time yesterday Scotland had hope. Now it has shame. tweets: Top marks to the cops for keeping the peace after things looked much more worrying earlier. They've got square in lockdown, all routes shut. A police statement said: "Officers continue to manage the situation and prevent further disruption. Most have now dispersed. Small group remains with police in attendance"
Political commentator John McTernan, who was political secretary to Tony Blair, told BBC News he was surprised that Alex Salmond resigned. He said: "It is the end of an era. This is what he came into politics to do. Nobody thought he would get an independence referendum, he got it and he lost it. "He lost it not narrowly. It was a big defeat. SNP heartlands such as Aberdeenshire where he has his seat, Perthshire, Moray, rejected independence. Paradoxically it would not have been so close if were not for Labour voters voting for independence." Carl: I am pleased with the result of the referendum but what a shame has Salmond resigned after what he has done for Scotland. I am sure the Scottish people do not want him to resign. He has done a fantastic job and should also hold his head up high on the results achieved on the referendum. He should stay and continue to be the great asset to Scotland that he is. Lib Dem MP Sir Menzies Campbell told BBC News: "I think there are 25% of the people in Scotland who believe in independence unequivocally. "Alex Salmond's great ability was to convert that 25% into nearly 50%. "There will always be people who believe in independence. It is a perfectly legitimate position. They won't go away. But I think most people are pretty well settled with the view that there should not be another referendum for a very long time, if ever." Pro-union protesters chant and wave Union Flags during a demonstration at George Square in Glasgow. Catriona MacPhee, STV journalist, tweets: Eerie scene in Queen St Station just now. Quiet & tense, with George Sq exit blocked, lined by riot police, & roar of chanting from outside. Actor John Hannah tonight told The One Show he would also like to see David Cameron resign. Mr Hannah said: "It would be nice of him [David Cameron] to follow suit". "I think one of the things that we've learnt about this is that 97% of the electorate in Scotland voted because they weren't happy with Westminster." There are still angry scenes in George Square in the centre of Glasgow. The police are trying to contain a group of protesters, who are waving union flags and letting off flares. The BBC's Laura Kuenssberg said the ruckus in George Square is not a stand-off between Yes and No campaigners. "It is hoolies turning up who want a fight." George Chambers posted this Alex Salmond tribute ahead of last night's results. It's what he calls "Salmond en croute". filing my blog earlier, Alex Salmond has announced he's stepping down as SNP leader and First Minister, once a successor is elected. Asked about future strategy, he made clear to journalists that the "once in a generation" view was his and not a pledge which will bind his successor. In saying the SNP will "hold Westminster's feet to the fire" on new powers for Holyrood, he left little doubt that this form of torture could well include the prospect of another referendum. whoever she may be - his observation that there's now a movement of 'Yessers' and other activists who are changing politics, and holding political leaders to account. Shadow Scottish Secretary Margaret Curran told BBC News there was a "deep disillusionment" with the way politics is conducted, particularly at Westminster. She said the proposals for devolution of powers in England would not slow down the promised change in Scotland. "The extra powers for the Scottish Parliament can be clearly implemented because we have been talking about them and planning them for some period now," she said. "The new proposals from the prime minister I don't think are thought through and he's not clear about them in the way that we are about Scotland." James Adams: Whichever side of the debate people have found themselves on no one can deny the impact that Alex Salmond has had on Scottish politics. He managed to lead the SNP to a victory that broke the Holyrood system designed to stop a majority and take the country into a referendum that may well permanently change UK politics for better or worse. Alastair Milne: Nice of Salmond to "accept" the result, did he think he had an alternative? An arrogant egotist, won't be missed. Horrible end to day when people absorbing #indyref result but a bunch of people wanting a Friday night fight. The answer is clear and it is here in Glasgow. The people of this great city voted by a majority to leave the UK. The anger they feel at the way Westminster currently runs things is felt up and down what remains our United Kingdom. Chris in London: Can we now have a national debate about the issues raised during this campaign? How about a referendum for all UK citizens on the abolishment of Trident and the setting up of an oil wealth fund that would benefit all the citizens in the UK? open to secession in urge to cut ties with Washington. Stewart Miles: Well done Scotland. You have moved British politics which thankfully will never be the same again. The English regionshave regional authorities and Wales and N& Ire will have have more powers. Actor Brian Cox, who is from Dundee, said it is the "Yes city of Scotland". Scottish actor Brian Cox, who has been campaigning for a "Yes" vote, told BBC News that Alex Salmond was "head and shoulders above any other political leader in these islands". He said: "I was not always a fan but I certainly am now. I have watched him grown and be such a statesman as a result of this." Mr Cox said he thought Alex Salmond would be "at the negotiating table" on the future of Scotland even if he is no longer first minister. He said: "He'll want to see that we don't get a bad deal. If you think about it, being leader and being head of negotiations on this so-called vow would be a difficult two jobs to do." "Yes" campaigners in Dundee held a final rally today in the city. Dundee voted "Yes" to independence in yesterday's referendum, by the highest margin of any local authority in Scotland. A Police Scotland spokeswoman has said that there are approximately 100 people from each side in George Square in Glasgow. There has been some minor disorder which has been dealt with quickly, with no arrests. The square is closed to traffic with local diversions in place. It is very tense in the square. It has calmed down a bit but is still very tense. Both sides have been throwing things, the police are in the middle trying to keep both sides apart. One side is singing Flower of Scotland and the other is singing Rule Britannia. their website which allegedly shows their reporter Ben Riley-Smith being "barred" from entering Alex Salmond's resignation press conference. Speaking on the George Square trouble, Lib Dem MP Sir Menzies Campbell said: "For people like me who are committed to the democratic process and who have valued the way in which this campaign has been conducted until now, it is extremely disappointing. "I hope that police will be able to make calm heads prevail and people will go home. The best possible thing would be a heavy shower in George Square. That is often a way of dispersing people who are ready to make trouble." Chris and Colin Weir, the multi-millionaire lottery winners who helped bankroll the "Yes" campaign, said: "Whilst saddened at his decision, Alex Salmond has nothing to reproach himself for. "He has energised our nation, not just in this campaign, but in all his years of service to Scotland. He has articulated the aspirations of a nation not just as a party leader but as Scotland's most successful first minister ever. "We wish him well and thank him for his part in making Scotland the confident, forward looking country it is today." The leaders of Scottish Labour and the Scottish Conservatives have condemned the scenes in Glasgow's George Square. Speaking to the BBC's Reporting Scotland, Ms Lamont said she hoped order was restored "as soon as possible" while Ms Davidson said: "We don't want to be seeing scenes like that on our streets." Yes campaigners and Loyalists who supported the Union have gathered in opposing protests in George Square in Glasgow, and it's fair to say the atmosphere is tense. Glasgow was one of four local authorities in Scotland to vote in favour of independence in yesterday's referendum. The others were Dundee, North Lanarkshire and West Dunbartonshire. tweets: Heading home to Strichen. With love and thanks from Moira and I for all your kind messages of support. This is the second time First Minister Alex Salmond has decided to stand down as SNP leader. He first won the leadership of the party in 1990 before stepping down in 2000. Scotland's now Finance Minister John Swinney then took charge before Mr Salmond assumed office again in 2004. The Loyalists have signs saying "Scotland is British". I see a flag that says Springburn/Derry Union up on the railings. Another flag says "Scotland is British, No surrender". There is lots of shouting of "this is our country". Scottish Finance Secretary John Swinney tells the BBC's Reporting Scotland that he respects Alex Salmond's decision to stand down. He repeats Mr Salmond's view that the referendum is a "once in a generation opportunity" and says the SNP "will work make sure that the commitments made in the referendum" by the UK parties about more powers are kept. "These have to be delivered and they have to be delivered within the timescale," he adds. There is definitely evidence of riot-trained police officers now coming in. The trouble started very quickly with the charge from the Loyalist side. We believe it was a coordinated charge. It came from different parts of the square and different angles. You could see flares going off in different directions. You could see people running in and they had concealed Union flags within their coats and jackets which they pulled out. I have been in George Square all day. It has ebbed and flowed, the crowd occasionally unpleasant, but about 20 minutes ago the atmosphere changed very noticeably. What I would describe as a Loyalist crowd turned up with lots of Union flags. All day the Saltire has been in evidence. There was a rush from the Loyalist side. Flares went up, the police came in, it all got very nasty for a while. the police have separated the crowds on either side of the square now. Protesters have let off flares at the gathering in Glasgow's George Square. Both campaigns are chanting slogans in George Square in Glasgow. A few firecrackers have been set off by both sides. Police are present and are trying to keep protesters separated. Here's another picture of the events at George Square. This is the scene in Glasgow's George Square right now. Crowds of "No" supporters and "Yes" supporters are being kept apart by police. Mr Swinney said Alex Salmond had changed the political landscape. He added: "The challenge for the next SNP leader and first minister will be to put the Westminster parties under pressure to deliver against the commitments that they made during the referendum campaign." John Swinney said he wanted to make clear his "deep and profound appreciation" for what Alex Salmond did to get the party and the Yes movement to "this point". Mr Swinney said: "He took us into government in 2007 when all the pundits said we couldn't do it. He won a majority in 2011 when absolutely every commentator said it was an impossibility and then he delivered an independence referendum which commanded 1.6 million votes for independence yesterday. "Alex has earned the right to decide at what moment he wanted to stand down." The Sunday Herald's Scottish Political Editor Tom Gordon: Pretty brutal farewell statement from @willie_rennie on Salmond: "He has exhausted his political purpose." Finance Secretary John Swinney told BBC Scotland that Alex Salmond had delivered "astonishing gains" for the SNP and "astonishing improvements" for Scotland. Mr Swinney, who was leader of the SNP before Mr Salmond, said: "I think that culminated in creating the opportunity for the people of Scotland to have the most engaged democratic decision we could have had about our future in the referendum yesterday, in which 85% of the public that were eligible to vote, participated. That was a great triumph for democracy and it was brought about by Alex Salmond." Bookmakers have already priced Deputy First Minister Nicola Sturgeon as the odds-on favourite to become the next SNP leader. Ladbrokes have Ms Sturgeon at 1/4, with Humza Yousaf next in line at 8/1. Alex Neil, Derek Mackay and Mike Russell follow at 10/1, with John Swinney priced at 16/1. William Hill is also offering odds - they price Ms Sturgeon at 1/3 and Mr Yousaf at 6/1. Scottish Trades Union Congress (STUC) General Secretary Grahame Smith said: "Alex Salmond has been a dominant figure in Scottish politics for over two decades. "Whatever you think of his politics you cannot deny his political achievements. The longest serving first minister; the first party leader to secure a Scottish Parliament majority; delivering a referendum on independence and increasing popular support for it. "His disappointment in not seeing the job through must be immense and, although a surprise to me, it is perhaps the right time for him to step aside as we now look to enhance Scottish devolution." "Now, as we move forward, we should remember that despite the range of views that have been expressed, we have in common an enduring love of Scotland, which is one of the things that helps to unite us all. "Knowing the people of Scotland as I do, I have no doubt that Scots, like others throughout the United Kingdom, are able to express strongly-held opinions before coming together again in a spirit of mutual respect and support, to work constructively for the future of Scotland and indeed all parts of this country. "My family and I will do all we can to help and support you in this important task." The Queen has issued a statement on the outcome of the referendum. It says: "After many months of discussion, debate, and careful thought, we now know the outcome of the referendum, and it is a result that all of us throughout the United Kingdom will respect," it reads. "For many in Scotland and elsewhere today, there will be strong feelings and contrasting emotions - among family, friends and neighbours. That, of course, is the nature of the robust democratic tradition we enjoy in this country. "But I have no doubt that these emotions will be tempered by an understanding of the feelings of others." The Queen said Scotland's vote to stay part of the UK was "a result that all of us throughout the United Kingdom will respect". Scottish Green Party co-convener Patrick Harvie said: "It's no secret that the Scottish Green Party and I haven't always agreed with Alex Salmond about a range of policy issues, but nobody in Scottish politics can doubt his commitment to the cause of Scottish independence, or the impact he has had, not only within Scotland, but also on a movement which still has the potential to reshape politics throughout these islands. "The first minister is 100% right to say that the aftermath of the independence referendum remains redolent with possibility, and that the incredible public engagement in our political process means that power must now lie with the public will, not with political parties in Westminster or Holyrood. "Despite our differences on a range of issues, I want to pay tribute to Alex Salmond for the role he has played in changing our political landscape. The future of Scottish, and of UK politics, could be entering a more open and creative period than we have known for many years. "If nothing else, Alex Salmond has been central to bringing us to that moment." Scottish Parliament Presiding Officer Tricia Marwick, who was elected as an SNP MSP before quitting the party to take up the politically-neutral Holyrood role, commented on Mr Salmond's decision to step down as first minister. She said: "Members from across the chamber will recognise the first minister as an outstanding parliamentarian and will join me in recognition of his substantial achievements and public service as an MP, MSP and as Scotland's longest-serving first minister. "He will bow out following the most remarkable national debate and democratic renewal of our nation." tweets: @AlexSalmond I am sad to see you go. This was never all about you but at the same time, without you we would have been nowhere. Thank you. Jim Daisley from Greenock texts: "Disappointed with the result but the 1.6 million people of Scotland standing up against Westminster, banking, big business and the media, and the politics of fear, should be proud. Congratulations and well done to Alex Salmond and I agree with his decision to resign and make way for new invigorated leadership. The president of the Law Society of Scotland, Alistair Morris, said Alex Salmond's place in "our nation's political history is assured". He said: "His achievements cannot be underestimated, not only as the longest-serving first minister and the first to obtain an overall majority at Holyrood, but also in securing a historic referendum on independence. "His passion for Scotland, his commitment to creating a fairer and more prosperous society and his formidable debating skills, both at Holyrood and Westminster, have been at the heart of Scottish politics for over 30 years. He has also been a proud and effective ambassador for Scotland on the world stage." UK Labour leader Ed Miliband said: "Alex Salmond has been a formidable frontline politician. "Whatever our disagreements, he always spoke his mind and he has always stood up for what he believed in. "Our task now is to make sure that we deliver on the timetable we've set out, to deliver extra powers to the Scottish Parliament, and we will deliver on that." tweets: We will deliver on our promise of further powers to Scotland on the timetable set out during the referendum campaign. Iain Murdoch from Fife emailed: Thank you Alex Salmond for all you have done to take Scotland forward to this point. You thoroughly deserve any rest you will now get. You have truly placed Scotland at the forefront of UK politics. Alvan Judson wrote: Just read your great news that Alex Salmond is resigning. Now he can go and spend his time watching re-runs of Braveheart until he, too, is blue in the face. Sam Wakerley: The only thing progressive about this whole debacle is the fact we gave Scotland the vote. True progress would be one world freedom passport, one currency, one renewable energy policy & every child having basic needs taken care of, with wants allocated based on effort and attainment. Call it UKIP call it SNP, call it BNP, nationalism is ugly. William Wright: And the lies have begun already. Millipede is scurrying back under the bench and retracting all his promises. I wonder how long it will be before Westminster fully rejects the lies they promised? David Cameron has said: "Alex is a politician of huge talent and passion. I respect and admire his huge contribution to politics and public life." Scotland's lesbian, gay, bisexual, transgender and intersex (LGBTI) equality charity, The Equality Network, said it wanted to say a "huge heartfelt thank you to Alex Salmond for significantly advancing LGBTI rights in Scotland". Policy coordinator Tom French said: "While more needs to be done, Alex Salmond should be incredibly proud of leading a government that has spoken out for LGBTI human rights, put in place some of the best hate crime legislation in Europe, and delivered one of the most progressive equal marriage laws in the world." In some ways it is a shock decision but in other ways it was not really a shock given the scale of the defeat. In a way he must reflect that although he has improved the SNP's standing hugely - they are now in government in Scotland and they got about 45% of the vote last night - he is a man who has a lot of people who just will simply never vote for Alex Salmond. There is a limit to his appeal. He may take the view that he does not have that final ingredient that will get a majority of people in Scotland voting for independence. He says he only made the decision this morning and that probably indicates that it was the scale of the defeat that made him decide to go. Sir Richard Branson tells the BBC News Channel that the referendum was "a great day for Britain", adding: "We should tip our hats to Alex Salmond for changing Britain for the better." Johann Lamont said Alex Salmond "should be proud of his career and not allow the manner of its ending to dominate his thinking. "There is no question that Nicola Sturgeon and he were a formidable team." Scottish Labour leader Johann Lamont says: "Alex Salmond turned a minority party into a party of opposition, into a party of government, and was responsible for there being a referendum on Scotland leaving the United Kingdom. "He has undoubtedly been an immense figure in Scottish political history. "I do not detract from his achievements when I say that his love of Scottish independence sometimes blinded him to its consequences." Former SNP leader Gordon Wilson said Alex Salmond fought a brilliant referendum campaign. He said: "It is not his fault that the Scottish people did not vote for independence on this occasion. The winning of 45% of the vote in the Scottish independence referendum is a superlative achievement. "It is a mark of Alex's integrity that he has taken personal responsibility. "He is undoubtedly the greatest Scottish politician of his generation." The London Evening Standard - an evening paper - has splashed on David Cameron's pledge for "English votes for English laws" - this picture tweeted by the paper's political editor, Joe Murphy. Mr Darling added: "He has rightly said that the referendum was a once in a lifetime event and that we all need to work to bring Scotland together. "He can look back with pride on being the longest serving first minister and to the huge contribution he has made to public life in Scotland. "I wish him well in the future." Better Together campaign leader Alistair Darling said: "Alex Salmond is a formidable political figure. He transformed the SNP into a party of government and delivered their referendum on independence which they had craved so long. "Today he has accepted Scotland's verdict, recognising that it is for others in his party to take the SNP forward." Mr Salmond reiterates that he has no plans to withdraw or retire from political life, when asked about his future by BBC Newsnight's Kirsty Wark. Ms Lamont, who faced Mr Salmond on a weekly basis at first minister's questions, said: "I do not detract from his achievements when I say that his love of Scottish independence sometimes blinded him to its consequences. "He should be proud of his career and not allow the manner of its ending to dominate his thinking. Scottish Labour leader Johann Lamont said: "Alex Salmond turned a minority party into a party of opposition into a party of government and was responsible for there being a referendum on Scotland leaving the United Kingdom. "He has undoubtedly been an immense figure in Scottish political history." Business leaders have paid tribute to Alex Salmond, following his resignation. The Federation of Small Businesses, which has 20,000 members, said he had made "a huge contribution" to Scottish public life and wished him well for the future. Ruth Davidson argued that Alex Salmond's "decision to step down will help our country come back together again". She added: "I am pleased that the first minister says he will continue to serve in Scottish politics. "Scotland will benefit from his experience and service as we move forward." Scottish Conservative leader Ruth Davidson said: "Alex Salmond has been the dominant figure in Scottish politics for the last seven years. "No-one can dispute his political achievements, nor fail to acknowledge his political gifts. "He has done the right thing in resigning. "While the referendum campaign has been hugely invigorating, by its very nature it has divided too." Nicola Sturgeon would be a clear frontrunner to take over as SNP leader and first minister after Mr Salmond steps down, but the question of who would succeed Ms Sturgeon as deputy is much less clear. Last time round, Mr Salmond and Ms Sturgeon stood for the SNP leadership on a joint ticket. In a statement, Deputy First Minister Nicola Sturgeon has just said she could think of "no greater privilege" than leading the SNP, adding that the decision to stand was "not for today". Deputy First Minister Nicola Sturgeon spoke to the BBC's Marianne Taylor about her life and career, and the responsibilities of power. "Alex's announcement today inevitably raises the question of whether I will be a candidate to succeed him as SNP leader," she added. "I can think of no greater privilege than to seek to lead the Party I joined when I was just 16. However, that decision is not for today. "My priority this weekend, after a long and hard campaign, is to get some rest and spend time with my family. I also want the focus over the next few days to be on the outstanding record and achievements of the finest first minister Scotland has had." Ms Sturgeon added: "The personal debt of gratitude I owe Alex is immeasurable. He has been my friend, mentor and colleague for more than 20 years. Quite simply, I would not have been able to do what I have in politics without his constant advice, guidance and support through all these years." Deputy First Minister Nicola Sturgeon said: "Alex Salmond's achievements as SNP leader and Scotland's first minister are second to none. "He led the SNP into government and has given our country a renewed self confidence. Through policies such as the council tax freeze, free prescriptions and the scrapping of tuition fees, he has made a real difference for hundreds of thousands of Scots. And yesterday he inspired 1.6 million of our fellow citizens to vote Yes to independence." says BBC political reporter Brian Wheeler. John Curtice, polling expert and professor of politics at Strathclyde University, says Mr Salmond "has form in providing us with shocks when it comes to the leadership of the SNP". "Some must remember the summer of 2000 when suddenly he announced he was standing down as leader of the SNP and was leaving the Scottish Parliament... then in the summer of 2004, he suddenly announced that in fact he was going to stand as leader again. "He spots opportunities and as a result of that he does provide us with shocks." watch Alex Salmond's three-minute resignation speech here. tweets: Gutted about @AlexSalmond 's resignation - he took us to the brink of independence and gave us all the chance to decide. When asked by the BBC's James Cook if his dream of independence is now dead, Mr Salmond says: "I think a referendum is a once in a generation process - that's my opinion." He goes on to say that he does not envisage another constitutional referendum in the "future we can see". tweets: It has been a privilege 2 serve under Alex Salmond. He has brought gr8 confidence 2 our nation &social progress 2 Scotland in face of UK cuts. tweets: Devastated to hear @AlexSalmond going to step down as SNP Leader. Without a doubt the finest politician of his generation. Thanks Boss.
.@AlexSalmond to remain First Minister until SNP elects new leader, scheduled for mid-November SNP conference, then vote of MSPs. Asked if he was adding to the upset for friends and party members on a day that was already difficult for them, he responded: "I have consistently argued... that this was not about an individual or a political party - or any political party - this was much bigger than that." "I see no sign of the divided country that some people were forecasting - 99% of people know we have elections and referendums to have a result." He says it's been an "invigorating process". The number of tweets about the Referendum dropped to under 40,000 between 3pm and 4pm. The figure is down 7% on the previous hour. tweet in the last hour is from Alastair Ross: "BBC is reporting Labour leader Ed Miliband will not sign up to the PM's plan to give more powers to the Scottish Parliament #indyref" It was retweeted 510 times. tweeted his latest video: "Were the cards stacked against independence? 'How Westminster Fear & Media Bias Shafted Scotland' is today's Trews." It is currently the most shared video. Alex Salmond says when he asked David Cameron about the timetable for more powers, the prime minister said it was a meaningless process. Lorna: I was heartbroken by the No vote and the acceptance by 55% of a pig in a Westminster poke. However, Alex Salmond's stepping down has left us leaderless and at the mercy of the spivs of the city. Andy in Darvel: Alex Salmond has put in a good shift, fair play. Is there grounds though for holding Scottish elections early now? Alex Salmond is continuing to take questions from journalists at Bute House in Edinburgh. "I am also proud of the 85% turnout in the referendum and the remarkable response of all of the people of Scotland who participated in this great constitutional debate and the manner in which they conducted themselves. "We now have the opportunity to hold Westminster's feet to the fire on the 'vow' that they have made to devolve further meaningful power to Scotland. This places Scotland in a very strong position." "Until then [November] I will continue to serve as first minister. After that I will continue to offer to serve as member of the Scottish Parliament for Aberdeenshire East. "For me right now there is a decision as to who is best placed to lead this process forward politically. "Therefore I have told the National Secretary of the SNP that I will not accept nomination to be a candidate for leader at the Annual Conference in Perth on 13-15 November. "After the membership ballot I will stand down as first minister to allow the new leader to be elected by due parliamentary process." "I have no intention of retiring from Scottish politics - there are a large number of things you are able to do when you're not first minister or leader of a political party." When asked his reasons for standing down, Mr Salmond says: "I had to make a judgement as to whether I'm best placed to take that opportunity forward - and I think others are. "And the party I'm sure will make a wise choice and take party and country forward. The most important thing is not about First Minister." Mr Salmond says there there are a "number of eminently qualified and very suitable candidates for leader". Alex Salmond is to stand down as first minister. First Minister Alex Salmond, speaking to members of the media, said: "I am immensely proud of the campaign that Yes Scotland fought and particularly of the 1.6m voters who rallied to that cause." Watch highlights of the night Scotland decided to stay part of the union. Watch #BBCtrending's take on the social media reaction from Scotland's No vote. First Minister Alex Salmond's first press conference since the result is due to start shortly. Watch Yes and Better Together supporters giving their reaction to a No vote in the Scottish independence referendum. One No supporter says he was very pleased when he woke up to the result but is "horrified" at the abuse he says he has been subjected to by Yes campaigners. "Throughout the whole campaign the nasty side of independence has come from the Yes campaign," he says, but Ms Leckie says "proportionately No has been nastier on social media". Moving to the more positive, an audience member says Scotland should be very proud that so many people were involved in the referendum campaign, and in politics for the first time. "The most important thing now is that we get these powers of devolution," adds the No voter. Another lauds the massive turnout - nearly 85% - and the passion she saw during the campaign. One member of the Big Debate audience gets very animated as she demands "detail, detail, detail please" on any new powers Scotland may receive. Ed Miliband signals that he will not sign up to the prime minister's plan to give more power to the Scottish Parliament at the same time as trying to agree new powers for English MPs. While accepting the need for reforms, the Labour leader says that he wants a process of debate to begin before the general election but - crucially - he calls for a constitutional convention to finalise reform to happen later, in the autumn of 2015. David Cameron had earlier said changes to address the so-called English question - to allow English MPs the same powers over England-only legislation that the devolved parliament and assemblies will have in Edinburgh, Cardiff and Belfast - "must take place in tandem with, and at the same pace as, the settlement for Scotland". BBC Scotland political reporter Andrew Black says the focus is now on how the UK government delivers its promise of more powers for the Scottish Parliament. what we can expect next here. So when is the next independence referendum? No, hang on. Stop whimpering like that. Bear with me. You may soon have withdrawal symptoms from the campaign, so why not plan for the next one? After all, 1.6 million people wanted Scotland to be independent - the nationalists among them irreconcilable to UK citizenship, some of them newly and passionately mobilised to the cause. They may be heart-sore at losing. It will hurt all the more to have seen the opinion polls narrow to a dead heat, with momentum apparently going their way, only to see a decisive result turn against them on the night. But they're not going away. So what else would happen to their cause but a campaign for another referendum to give it another big heave? Garth Beecroft: The high turnout shows that people are more interested in politics & policies rather than the person, which is how it should be. It's the bickering between politicians & one-upmanship that turns people off. Mat Dixon: Is it just me that feels slightly annoyed by the Scots voting No? I think it was unfair that the English cannot have a vote to see if we still want to be in a union with Scotland, Wales and Northern Ireland. It seems, from my point of view, that because I am English that everyone assumes that I want to be classed as British. I really hoped that they would vote Yes then we could get on with our own business and they could get on with theirs. Michael Prager: England must have the same devolved powers on law making and tax-raising as the Celtic fringe of the UK. The famously unwritten constitution of the UK must be amended so that, in balance to greater devolved powers, there is a requirement that no one nation can take decisions that affect the others without a clear, say 2/3 majority across the entire UK on matters that affect the boundaries of the nation, the rule of law or the delegation of powers to non UK, supra national bodies, e.g. The EU. Lord Smith of Kelvin, who has been appointed to oversee the process of devolving more powers to Scotland, says it is "time for us to come together and work together". "I have started work today and will present what I hope will be unifying recommendations on 30 November," he added. "There will be an opportunity for everyone to have their say. First, I will be speaking to all the UK and Scottish political parties. "Secondly, I will be engaging the institutions of Scotland, whether it be trade unions, businesses or voluntary organisations. "Lastly and most importantly, 4.2 million people in Scotland were involved in the referendum. They aren't all represented by political parties or institutions; they are individuals who have ideas and thoughts on our future. I want to reach out to them and make them an essential part of this exciting process." BBC News website reader: Never felt so ashamed to be Scottish. We chose subservience instead of freedom. The establishment can again celebrate that nothing has changed. BBC News website reader: Scottish referendum. Now treat England exactly the same. That is - establishment of an English parliament with the same powers and then a referendum on an independent England. US President Barack Obama welcomes the referendum result, congratulating the Scottish people for a "full and energetic exercise of democracy". "We have no closer ally than the United Kingdom, and we look forward to continuing our strong and special relationship with all the people of Great Britain and Northern Ireland as we address the challenges facing the world today," he says in a statement. Derek, Scotland: Lorna, 14:07: Perhaps the old voted NO because they are experienced with detecting when a story doesn't add up. Let's not pretend this wasn't a massive endorsement of the union. YES failed to win the argument on every level. Tom, Glasgow: I'm angry today: angry at the dyed in the wool Labour voters who only vote Labour because they always Labour; notwithstanding the fact that their 'new Labour' party is now so far to the right and in bed with the Tories; and I'm angry at the older voters who only had their self interests at heart over the needs of young people and the future of this country. If David Cameron thought that offer to put Wales at the centre of the debate over a new UK would find him some friends in the Welsh Assembly this morning, he was wrong. Labour's Carwyn Jones, the First Minister for Wales, rounded on him pretty quickly, accusing David Cameron of almost sleepwalking into disaster over Scotland and now potentially doing the same over the rest of the UK. For two years, Jones has been calling on a UK constitutional convention. That, it seems, isn't going to happen in three months. The real problem for Welsh Labour here is two-fold: they don't have much leverage. This discussion, increasingly, is going over the relationship between Scotland and England. Secondly, one for the Welsh MPs. Not the West Lothian question, but the Clwyd West problem, because Labour has 26 MPs here in Wales. If you take them out of Westminster, clearly that causes a headache next May. So, the response to that offer from David Cameron - cool, I have to say. People do want more powers, but they want a proper seat at the table too. While more than 1.6 million Scots voted Yes, the campaign only topped four of Scotland's 32 local authority areas. See the breakdown of the vote. I think the big question for Northern Ireland is can it handle any more devolution? Can it handle any more power? Government here in Stormont is not like anywhere else in the United Kingdom. We have a mandatory collation of five different parties. The two main parties - the DUP is a centre right unionist party, and the other party Sinn Fein is a hard left nationalist party. They don't agree on very much. First Minister Peter Robinson and Deputy First Minister Martin McGuinness are at loggerheads at the moment over the implementation of welfare reform which hasn't happened in Northern Ireland and as a consequence it will cost the budget here £84m this year, £114m next year. The question arises: if they got further tax-raising powers or if they got the ability to have more power over their financial affairs, would they be able to manage that? The one thing they do agree is corporation tax should be devolved. Two quotes to leave you with. Peter Robinson: "There is no point in giving the executive more powers. It is not capable of controlling the powers they have." And Arlene Foster, of the Department of Enterprise, Trade and Investment, says there needs to be a "huge dose of reality". The Big Debate, says it is easier to run a campaign for change than a campaign for the status quo. "No ran the wrong campaign for 90% of it because they ran a campaign on telling Scotland they couldn't do something which actually they could do." speaking on The Big Debate, says Scotland is now a "different place". He adds: "There is a sense of opportunity and a change in the air and that is actually really very exciting." Louise Batchelor, Yes campaigner, says she is finding it hard to be positive about the result. "I feel as if I'm at a funeral for an idea that could have been realised last night and wasn't and you have to do that thing that you do at a funeral for a friend of brightly smiling." She fears the nation is moving towards a period of "nasty politics", adding the referendum was a "wasted opportunity". Scotland's local government minister, Derek Mackay, encapsulates one of the key Scottish government messages of today, that more powers must now be delivered by the UK government. He stops short of suggesting there'd be another independence referendum if there's any dithering, but adds: "Westminster is not off the hook". Carolyn Leckie, former Scottish socialist MSP and member of Women for Independence, tells the Big Debate she is disappointed by the result but is "really proud" of the Yes campaign. "The Yes campaign in general was extremely positive, creative, visionary, inclusive, democratic, wanted to have people discussing things." tweets: 72% of 16/17yr-olds voted Yes - more than any other age group. Polls got that completely wrong. Ballot extension didn't 'backfire' on SNP. tweets: I never thought I'd see a Scottish #indyref in my lifetime. I don't think I'll see another. That's how democracy works. Bethan Scotford: This shows democracy at work and at its best! A historic and totally exemplary example of how Democracy is meant to work, and how democracy can work. Congratulations to all Scottish people for being so articulate and informed about the issues involved, and for turning up to vote, so that the result is truly representative of the 'will of the people'. An impressive people! They have paved the way for newer steps to be taken across Britain, in terms of political re-formation. Andy in Newcastle upon Tyne: I'm reminded of an analogy as we look forward to the UK continuing but with the inevitable calls for change. Whether or not to be a member of a club is an individual's choice. But what the club rules are is for all of its members to decide. Jase Ayathorai: To accept defeat with dignity is to be honourable. But to try to couch defeat within the context of scaremongering is an insult to the ability of Scots to think and make rational decisions! Remember, you can keep up to date with all the latest reaction and analysis from the Scottish referendum on television, on radio and online. On BBC One Scotland, there are regular updates through the afternoon before a special Reporting Scotland between 18:30 and 19:30. Then, Sarah Smith hosts a referendum special of Scotland 2014 from 22:30. London Mayor Boris Johnson says: "I'm absolutely thrilled the country I grew up in is whole and entire and intact. It's really wonderful... what we need to do now is for everybody cool off, simmer down a bit and try to sort out some of these constitutional promises made to Scotland in a way that's totally fair to England, London and the rest of the country." Mr Johnson, who recently announced he would stand as an MP in the general election sparking speculation he is chasing David Cameron's job, adds: "We need to work out how to make sense of the promises to the Scots - the financial promises - the perpetuation of the Barnett formula for instance - in such a way that doesn't disadvantage the rest of the country and in such a way that doesn't make a nonsense of democracy at Westminster. We need to do it in a very careful way." Big Debate with Gary Robertson is getting under way on BBC Radio Scotland. We'll bring you a flavour of what voters have to say on the result. I've just arrived in a very empty Scottish Parliament building - then again it's always pretty deserted on a Friday. But things will crank up again next Tuesday when MSPs reconvene to hear First Minister Alex Salmond's next move, when he makes a statement to Holyrood. The number of tweets about the Referendum has dropped to under 50,000 between 1pm and 2pm. The figure is down 13% on the previous hour. tweet in the last hour has come from Wired: "Designers everywhere thank Scotland. Long live the Union Jack, a true design masterpiece" along with a picture of the union flag. It was retweeted 311 times. Nicholas Kristof. He tweeted: "Scotland's 'No' Vote: A Loss for Pollsters and a Win for Betting Markets." tweets: 1.6 million people when told No they can't by the establishment and their business and international friends said Yes we can. Proud of them. Elizabeth: Feel totally humiliated that, as a country, there are people still happy to let Westminster decide what happens with our revenue. Scotland, I thought, was a strong nation! Unfortunately not. Don't think Scotland could have got any worse than what it is now had we got independence. Disappointed we never got a YES! Alistair: The union has been given one last chance. If we, including all on the Yes side, are honest, all of the problems what we need to fix can be fixed inside the UK. The question is, will they be? We know that we will be together, time will prove whether or not we will be better. The powers that need to be devolved are those that can make Scotland more prosperous and fairer. If, in a decade or two we are not more prosperous, and we do not have a fairer society, because the powers needed to achieve these things are not devolved, the union will finally end. Lorna, Glasgow: I'm deeply depressed that the old voted No while the young voted Yes. So, the retired will lunch out while young working families depend on food banks. Anon: England should vote to decide if the ungrateful Scots should stay in Britain. tweets: By shifting the debate to the West Lothian Question, David Cameron cannily puts Labour in a very sticky position. BBC News School Reporters have been giving their reaction to the No result. Students at Hermitage Academy in Helensburgh felt the result was a positive thing locally as it protected the future of the Faslane Royal Navy base. Kirsten, 17, said: "I think it is quite good for Helensburgh as it is a safeguard for the base which will keep local businesses afloat." The first-time voters at the school had the experience of going to the polling station for the first time. Ryan, 17, said: "It wasn't as exciting as I expected," while Jonathan said: "It was exciting but bland at the same time, although just putting an X meant a lot to me." There is plenty of praise among Persian-speaking Twitter-users for Scotland opting to remain in the UK, BBC Monitoring observes. mohebatre" says it is Britain's destiny to "maintain its greatness". shahohoseni", there are three winners in the referendum: the people, democracy and the right of self-determination. But a few people, including blogger "
imanbrando" say Scots "are not brave enough to be independent because its men wear skirts". A notable number of Persian-language tweets question whether the referendum took place at all, calling it a BBC "plot" to spark separatism in other parts of the world. Joy Ball: A clear and overwhelming mandate for the status quo! Let's put this NO vote into perspective... a clear and large majority of votes (55.303%) responded NO to independence - this represents a differential of over 10%; yet a margin of 1000 times smaller in favour of YES (50.005% vs 49.995%) would have been sufficiently large mandate for Scotland to have been independent this morning! That is why the Quebecois advised the Scottish Government not to go with a simple absolute majority vote on this issue. Geoff James: Looking at the map of how people in the 32 Scottish councils voted, those opposed to independence nearly ended up being dominated by those voters living in a very centralised area of the country based around Glasgow... not unlike the situation the pro-independence supporters complain about when they talk about London. S. Saffin: Alex Salmond must be over the moon today. A Yes vote and he had to make good on a number of unlikely promises. Now, anything positive in Scotland he will claim as a result of his obtaining concessions; anything negative wouldn't have happened if the vote had been Yes. It was said a Yes vote should result in Cameron resigning. I bet the thought of resignation will not enter Salmond's mind even though he's lost. The big question about the Prime Minister's plan to hand more control over taxes, spending and welfare to the four nations is how far this would end the subsidy of Scotland, Wales and Northern Ireland by England, and especially by London and the South East. For all that it may sound attractive to the Scots, Welsh and Northern Irish to have greater influence over their respective economic destinies, presumably that would be less desirable if at a stroke they became poorer. The point is that as and when there is an English Parliament for English people - of the sort that the former Tory minister John Redwood has been demanding, and David Cameron seemed to concede today - the financial transfer from England to the rest of the UK may be harder to sustain. John Sweeney from Airth: I am disappointed. I accept it is a democratic vote and I have to get on with my life now. I hope the promises of the British government do actually transpire. That worries me. And I don't think the idea of independence is going to go away in Scotland. James Beaven, a student in Edinburgh: I am relieved rather than ecstatic. It is not a resounding vote either way, 10 points is good but we were looking at a 20-point lead earlier in the campaign. I also feel that the rhetoric in the campaigns took a nationalistic tone in the sense that both sides of the debate took Scotland to be a differentiated group to the rest of the UK, rather than looking at what unites us as part of the UK. I don't think the aftermath is going to rumble on for too long. I think people will try to embrace the result rather fight it. Patricia Smith, Dundee: Gutted. I just feel like we've let the country down. A Yes vote to me meant an awakening, it would have been like waking up and embracing a new chance to do something for ourselves and future generations. We could have had belief in ourselves and not just blame Westminster for everything. I feel like we had a chance to change things and we've blown it. I hope that Catalonia get a chance to do what we have failed to do. We have to respect that is what people have voted for. I just don't see that we are going to get what we have been promised. I'm so upset that we didn't have the bottle to go for it. We lost an opportunity. About 04:30 in the morning is the time even the liveliest parties tend to wind down. The guests - some of them looking the worse for wear - begin to leave; the plates and champagne bottles are cleared away; the party balloons begin to shrink and sag. But at the Marriott Hotel in Glasgow, 04:40 BST was the time people started to stand up, fill (or re-fill) their glasses and turn their attention to the giant TV screens on the wall. Read Political Correspondent Ben Geoghegan's take on the celebrations of the Better Together campaign. I'm in the centre of Glasgow, one of the few cities to actually vote Yes but where people are coming to terms with a really quite decisive defeat - a defeat brought about it seems by the shy Nos. The silent majority, people who didn't put up posters, didn't wear badges, didn't talk to us journalists, but in the privacy of the polling booth finally expressed their true support for the Union. 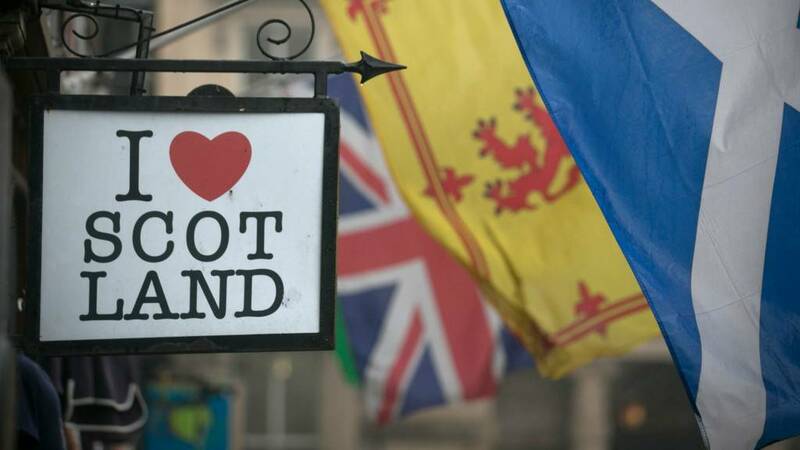 For so long, politics in Scotland has been dominated by the issue of independence and it has hung over relations between London and Edinburgh, even soured relations between the two capitals. Now, all sides accept that is over and is over for a generation and maybe even longer. But if the referendum is over, its aftermath could yet prove as protracted, as difficult, because David Cameron will now not only have to live up to his promise to hand more powers to the Scottish Parliament, he has coupled that with a promise to devolve more powers to the rest of the UK and to the same timetable as handing over further powers to Scotland. What that means is he wants a new deal for England Wales and Northern Ireland by January of next year. That is an extraordinarily daunting, difficult and potentially divisive process. tweets: Labour in Scotland and everywhere must become real Labour again. We are ready to help them with that. To get the Tories out and the SNP too. The German Foreign Minister believes the No result in the independence referendum is "a good decision for Scotland". Frank-Walter Steinmeier said: "People in Germany have followed with great interest the lively debate about independence in Scotland and in other parts of the United Kingdom. I have great respect for Great Britain's exemplary democratic culture as it was displayed in this referendum. "The vote is clear: People want a strong Scotland within a strong Great Britain. I believe this a good decision for Scotland, Great Britain and for Europe. "We wish that the United Kingdom stays an powerful and engaged partner in Europe, and we are looking forward to the continuation of a close and trusting close partnership." The number of tweets about the Referendum has dropped to under 55,000 between 12pm and 1pm. The figure is down 7% on the previous hour. tweet in the last hour is from William Hague: "PM @David_Cameron has asked me to draw up plans for a fair settlement for the rest of the UK alongside new powers for Scotland." which was retweeted 148 times. Lots of broadcasters, including CNN, the BBC and ABC, are topping the influencer chart.